Successfully installing any Joomla! component / plugin / module depends on many factors and the process may be interrupted by a number of reasons. In this article we will be providing explanations and solutions for all possible situations. The most common factor that intervenes in the installation process is how permissions are set for some key folders, in which components usually place their files. /media - some extensions place files in this folder. It is mainly used for media files, such as images or videos. In order to find out for which folders you need to verify permissions (for a certain extension) simply open the extension's installation package (.zip archive) and analyze it's folder structure. Each of our components has its own Installing and uninstalling documentation section where all folders (related to it) that require 755 permissions are listed. Extract the installation package (archive) into a folder (which can be named in any way you like) and upload this folder in the Joomla! installation's default tmp folder via FTP (using a FTP file manager like FileZilla). Head to Extensions >> Extension Manager >> Install from Directory, provide the path to the uploaded folder and click on Install. Joomla! will automatically retrieve the needed files from the specified location. When attempting to install an extension through the default Extensions >> Extension Manager >> Upload Package File feature you might get a blank page after clicking on Upload & Install. If this is the case, you will need to check whether your PHP is configured in such manner that it displays errors or not, as it is necessary to know what error is being returned by PHP in order to find a solution. Head to Site >> Global Configuration >> Server and set Error Reporting to Development. Now Joomla! will report all errors and warnings as they occur. The code will activate the display_errors option for your website. This occurs when Joomla! fails to copy a file / folder from the tmp folder to it's destination. It is, most likely, generated by the fact that there are not enough write permissions set up for the destination folder. To fix this, simply make sure that there are enough permissions set for the destination folder. This error is shown when Joomla! does not manage to create a folder. Setting up the correct permissions for the folders where the component is to be installed should resolve the issue. The code above will improve how the error message is displayed by adding the source and destination folders to it. This way, you will be able to know exactly which folders do not have enough permissions set. The code will alter how the error message is displayed, by adding the source and destination folders to it. You will now be able to identify whether the path to the tmp folder is incorrect or if its permissions need adjustments. Another solution to this would be to first unzip the package contents, upload them via FTP in one or your website's folders, and then install the package via the Extensions >> Extension Manager >> Install from Directory feature. All extensions are installed based on an XML file which provides destinations for all of the component's files and folders. If this file cannot be found (because the .zip package could not be extracted), you will get this error message. The solution to this problem is to install the extension as explained in this article's FTP upload section. This occurs when the path to the tmp folder was provided incorrectly in Joomla! 's configuration (Site >> Global Configuration >> Server >> Path to Temp Folder field). To fix the issue, make sure to specify the absolute path to the tmp folder. Another solution would be to install the extension through FTP upload. The present error occurs when an extension was improperly installed. When this happens, some instances of the extension remain recorder in the database. 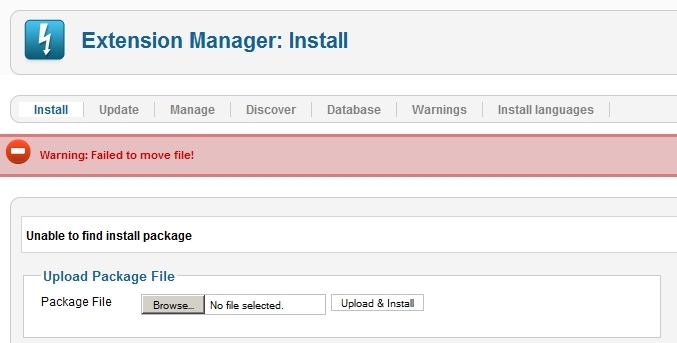 Head to Extensions >> Extension Manager >> click on Manage >> select the extension and click on Uninstall. After doing so, please try reinstalling the extension. Replace component (in com_component) with the actual name of your component. This is also available for plugins (plg_plugin) and modules (mod_module). Try reinstalling the component after running the query, it should appear in the Components menu this time. Replace component (in com_component) with the actual name of your component. The result to this issue is the same as above, the component will not show up in the Components menu. However, the cause is different: the root item from the #__menu table(with id=1) is missing from the database. If the root menu no longer exists, Joomla! will not be capable of locating it's subsidiary menus. then try installing the component one more time.